Jaypee Institute of Information Technology, Noida has advertised in THE TIMES OF INDIA newspaper for recruitment of Teaching Faculty- Professor / Associate Professor / Assistant Professor (Senior Grade / Grade II / Grade I) jobs vacancies. Interested and eligible job aspirants are requested to apply on or before 20th October 2018. Check out further more details below. As per AICTE norms. Should have good academic record. How to Apply: Interested and eligible candidates are requested to apply online at the following web address given below. 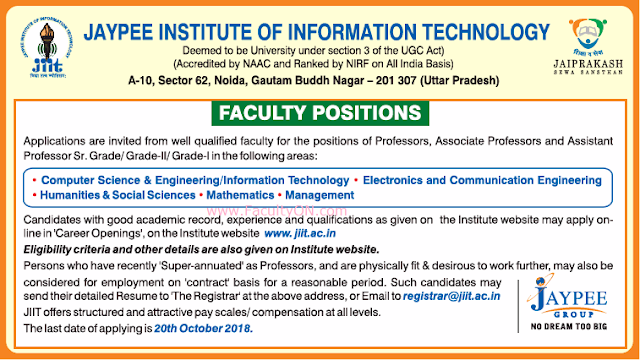 Persons who have recently super-annuated as Professors, and physically fit & desirous to work may send their resume to the registrar through postal or email address.